Sir, allusion has been made, in an early stage of this debate, to the history of the excitement which once pervaded a considerable part of the country, in reference to the transportation of the mails on the Lord’s day. Caleb Cushing was born in Salisbury, Massachusetts. He was an American diplomat who served as a U.S. 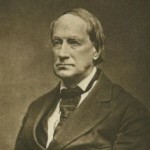 Congressman from Massachusetts and Attorney General under President Franklin Pierce. He entered Harvard University at the age of 13 and graduated in 1817. He was a teacher of mathematics there from 1820 to 1821, and was admitted to practice in the Massachusetts Court of Common Pleas in December, 1821. He began practicing law in Newburyport in 1824. During the 27th Congress, he was chairman of the U.S. House Committee on Foreign Affairs. Cushing was, however, appointed by President Tyler, later in the same year, to be commissioner and United States Ambassador to China, holding this position until March 4, 1845.